THE WORLD NEEDS US, NOW. I have been convinced of this for the 20 years since I found this extraordinary faith, and Stephen Mattson’s book spells it out very clearly. But as the book also expresses very well, Christianity—the version that actually follows the example of Jesus, the one whose primary focus is self-sacrificial love—is exactly what our society needs. And here is where our role as Anabaptists becomes clear. I know we tend to shy away from tooting our own horn, lest we become like other denominations that consider theirs the ONLY legitimate kind of Christianity and look in judgement on all the others. I think we should always pay attention to that impulse and embrace that lovely humility. But if we continue to humbly refuse to acknowledge the wonderful things we have to offer, that means we fail to actually offer them. And again, what we have to offer is what the world needs right now. Mattson points out the sins of Christendom, how much of the problem since Constantine has been Christianity’s comfortable position as the dominant and privileged culture. Haven’t the Anabaptists been the most consistent over history in resisting Christendom? Mattson documents how people are abandoning Christianity because it lacks authenticity. As someone who came into this faith from “out there” among the mainstream, I can say that authenticity is one of the best gifts that our community has to offer. When I found the Mennonites, I knew instinctively that “I don’t have to pretend with these people.” And being allowed to be my authentic self, my faith has taken on deeper dimensions than I ever could have imagined. Mattson highlights the need for courage to truly follow the way of the cross. How many Anabaptists let themselves be martyred to stay true to their faith? And, coming back to the overwhelming human need to be in community, the persecution that our ancestors experienced made community an imperative. That focus continues in our practices today. But one thing we do have in common with the rest of Christendom is that we are overwhelmingly white, and privileged. We come from great roots, but it has been a while since we have had to step out of our comfort zone. And that puts us in danger of failing God’s people as much as every other form of Christianity. God’s people are hurting, and we are being called not to fail them—not to fail each other. 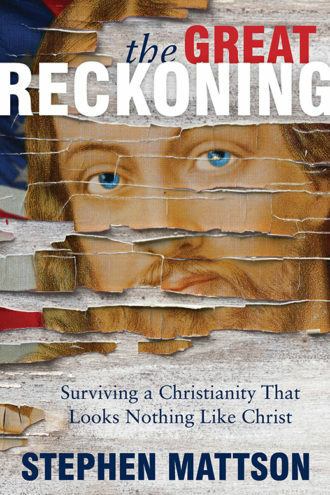 The Great Reckoning: Surviving a Christianity That Looks Nothing Like Christ is a great resource for your small group, Sunday School class or book club.